Just because it’s fall, doesn’t mean you have to say so long to #TacoTuesday. Simply adjust your tacos for the season with these great recipes packed with delicious fall produce. Chef Alex Stupak calls parsley-flecked green chorizo the “vegetal cousin” of the more commonly seen red variety. 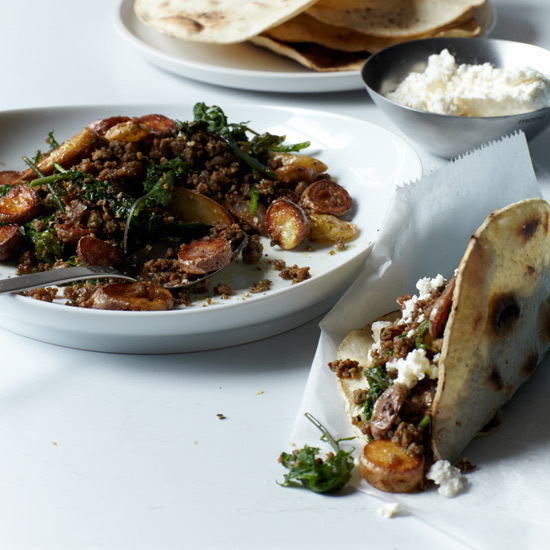 Here, he sautés the crumbled sausage with kale and fingerling potatoes for an exceptional taco filling. This inauthentic but delicious skirt steak taco is topped with a smoky, rich, nutty salsa made with toasted chipotles and pecans. A crispy mix of chorizo and potato chunks makes for a hearty taco filling. Chef Alyssa Gorelick wraps grilled vegetables and tofu in tortillas with an eggplant-and-ancho-chile spread that gives the tacos a rich, smoky taste. Fish tacos get a fall makeover with lentils and onions pickled in apple cider vinegar. Chef Jenn Louis uses lots of aromatic spices in this hash-like beef picadillo, which also includes toasted almonds and sweet golden rasins. Best Taco Spots in the U.S.